The Software Specs add-on is designed to help you display software specs on your WordPress website, and add extra schema.org markups to your entries. The add-on gets its data from the WPRichSnippets’ Schema post meta. Widget to display Software details on sidebar. Shortcode to display Software changelog details. 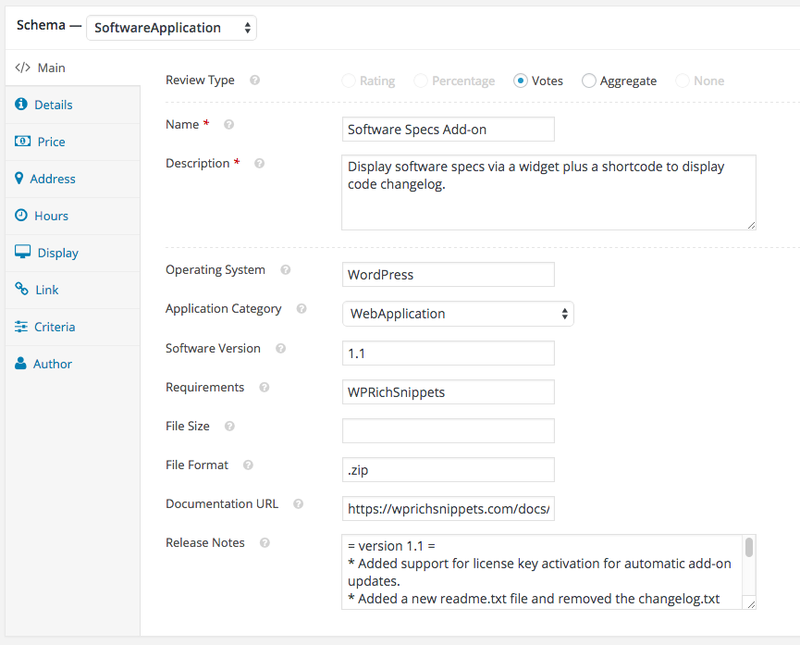 To make the add-on display its output, you must fill the Software Specs details within the WPRichSnippets plugin. In the Schema post meta, within the Editor page; you can set schema type to SoftwareApplication and fill the required fields. A new widget called Software Specs will show in your WordPress Widgets page, you can use this widget to display details about your software on the sidebar. The Software Specs add-on has a very simple settings page. We are using this widget here on wprichsnippets.com, you can see on this same page you are viewing now, or check all other add-ons.